Within Barcelona's Old Town, the political and geographic centre of the city is located. 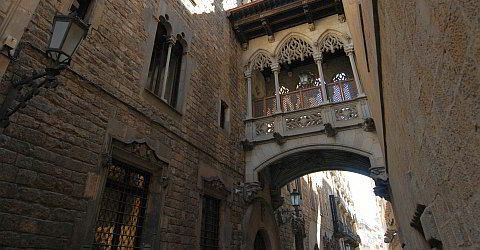 The Ciutat Vella (Catalan for “Old City”) tells stories from almost all eras of Barcelona's history: starting 133 before Christ with the Romans, and the dominion of the Visigoths, the Moors and the crown of Aragon through to the Spanish Civil War and the modern Barcelona. Thousands years of history seem to be combined like it has never been different. You can find remaining parts of the old city walls next to some of Picasso's art work, next to rediscovered pillars of the old Roman Forum and even more treasures that remained of the city's history. The four districts Raval, Barri Gòtic, “Sant Pere, Santa Caterina i la Ribera” and Barceloneta together form the district Ciutat Vella. Ravalis the most western district of the Old Town and counts as Barcelona's most multicultural district. The word Raval descends from the Arabic word Rabad, which means as much as neighbourhood or district. The Old Town district - its character is shaped by immigrants - is located to the west of the Ramblas. The Rambla separates the district Raval from the Gothic district. A part of the medieval city wall used to run along the Rambla. When the city was extended and the defensive wall was torn off, Barcelona's most famous strolling promenade was formed. The gothic district is the political, cultural and also the touristic centre of the city. The former Roman settlement Barcino, which is counted as the largest Roman dig outside of Rome, is located here. Eastern of the Barri Gòtic, separated by Via Leietana, the district “Sant Pere, Santa Caterina i la Ribera (El Borne)” is located. Here you can find the Parc de la Ciutadella and the zoo. Barceloneta, the district between the old harbour and the beach, has a special role since it hasn't been inside or along the city walls. 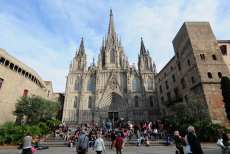 It is Barcelona's smallest district if you compare the number of inhabitants. Many narrow and winding alleys dominate the townscape of the Gothic district, the Barri Gòtic. The Barri Gotic offers a lot of fascinating history, for example the dig of the roman settlement Barcino and the cathedral of Barcelona. The Raval has a lot of charm, shopping zones, several sights and many opportunities to live down to earth. Next to one of Barcelona's oldest and most famous markets, the Boqueria, the Raval also houses the city's most important contemporary art museum, the "MACBA". Directly to the east of the Gothic District, separated by the four-lane Via Leietana, is the neighborhood of "Sant Pere, Santa Caterina i la Ribera (El Born)." The southern part of the district "La Ribera" (El Born) is today famous for its many Bars, restaurants and clubs and is one of the hippest spots in Barcelona. 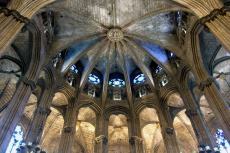 ​​El Born also has a variety of galleries, small designer shops, and of course the church Santa Maria del Mar is located here. 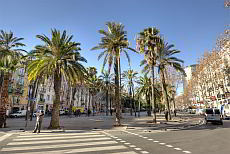 Barceloneta, the district between the Old Port and the beach - the smallest district of Barcelona in terms of population - plays a special role here; it has never been within the city walls and therefore does not belong to the historic city center. 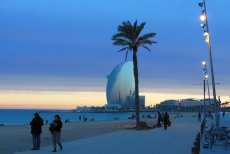 If you like the beach, the sea and the Mediterranean flair, you will love Barceloneta. Book a special view over the city: a coastal tour with the Golondrinas. Classical music in the special atmosphere of the MEAM. The concerts take place every Saturday night. A city tour with a lot of fun: you will see a lot on your tour with the segway.